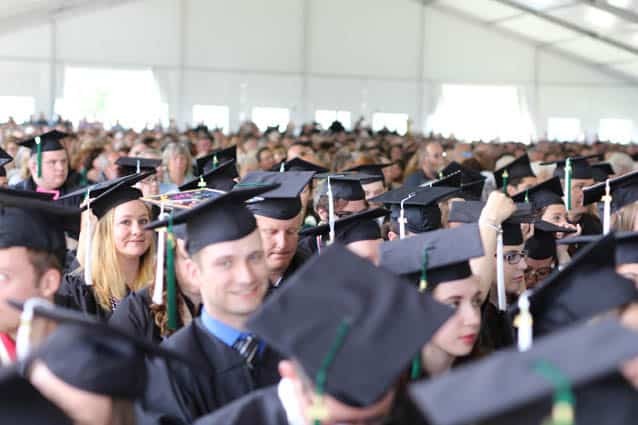 CASTLETON — Saturday, May 7, Castleton hosted the first Commencement ceremony as Castleton University. The celebration was held at 11 a.m. in the Castleton Pavilion and featured guest speaker Captain Richard Phillips. For five days in April 2009, Captain Phillips became the center of an extraordinary international drama when he was captured by Somali pirates who attacked and boarded his ship, the Maersk Alabama. To protect his crew, Phillips made a conscious decision to put himself directly in harm’s way and offered himself as a hostage. The standoff dragged on until April 12, when members of the U.S. Navy SEALs were able to make the rescue. This year’s event marked Castleton’s 229th Commencement ceremony, with the largest graduating class in Castleton history: 533 graduates. Phillips is the author of “A Captain’s Duty: Somali Pirated, Navy SEALs, and Dangerous Days at Sea,” the story of his experiences and his remarkable rescue. This dramatic story was also made into a motion picture by Columbia Pictures titled “Captain Phillips,” starring actor Tom Hanks, which was released in October 2013. In his address, Phillips informed the graduates that today was the start, not the end, of their education and offered advice and witticisms. He did not address his harrowing experience as a hostage of Somali pirates, except in a list of crises he’s faced. “I’ve dealt with pack ice, and iceberg damage in the Arctic, fires in the engine room, and on deck, emergency medical evacuations, hurricanes, typhoon, West African revolutions and even a little incident a few years back with Somali pirates,” he said. Philips is a graduate of the Massachusetts Maritime Academy, a member of the International Organization of Masters, Mates & Pilots Union, and a licensed American merchant mariner. He became captain of the MV Maersk Alabama in 2009. Phillips married to Andrea Coggio in 1987. They have two children, Mariah and Danny, and reside in Underhill, Vt.